The main difference between essential and nonessential nutrients is that the body cannot synthesize the essential nutrients at all or in sufficient quantities and we must obtain them through the diet whereas the body can synthesize the nonessential nutrients but, we can obtain them through the diet as well. Furthermore, some building blocks of carbohydrates, lipids, and proteins, certain vitamins and minerals and water are essential nutrients while biotin, vitamin K, cholesterol, dietary fiber, certain amino acids and fatty acids are non-essential nutrients. Essential and nonessential nutrients are two categories of nutrients required by organisms for their growth, survival, and reproduction. The other types of nutrients are the conditionally essential nutrients and non-nutrients. Essential nutrients are a class of nutrients which cannot be synthesized by the body. Here, some essential nutrients are not synthesized by the body at all while the synthesizing quantity of the others is not sufficient. Therefore, we have to include the essential nutrients in the diet. However, these nutrients are indispensable for the metabolic process and the maintenance of the functioning of tissues and organs. That means; the essential nutrients are vital for growth, reproduction, disease prevention, and good health. Furthermore, the building blocks of the three macronutrients are essential nutrients. Out of them, carbohydrates serve as the primary energy source of the body. Though the body can synthesize the carbohydrate precursors, the amount is not sufficient to provide energy. Therefore, we have to include them in the diet. In comparison, there are nine amino acids (phenylalanine, valine, threonine, tryptophan, methionine, leucine, isoleucine, lysine, and histidine) and two fatty acids (alpha-linolenic acid and linoleic acid) essential to the human body. On the other hand, vitamins and minerals are the two essential types of micronutrients to the body. Vitamin A, B, C, E, and K are essential vitamins and vitamin D can be a conditionally essential vitamin which becomes essential under certain conditions. Also, water becomes an essential nutrient which is important for maintaining homeostasis. Nonessential nutrients are another class of nutrients that our body can synthesize. However, we can obtain them from the diet as well. But, they have a significant effect on health. That means; they can be beneficial to the body and can be toxic when taken in excess amounts. Furthermore, some amino acids and fatty acids are nonessential since the body can synthesize them. The amino acids including alanine, arginine, asparagine, aspartic acid, l-cysteine, glutamic acid, glutamine, glycine, histidine, ornithine, proline, selenocysteine, serine, taurine, and tyrosine are nonessential. Also, the rest of the fatty acids except the essential fatty acids are nonessential. Moreover, the dietary fiber is an example of a nonessential nutrient. Though the body cannot absorb it, it is important for maintaining the bowel movement, avoiding constipation. Also, biotin, cholesterol, vitamin K, vitamin D, etc. are nonessential nutrients. 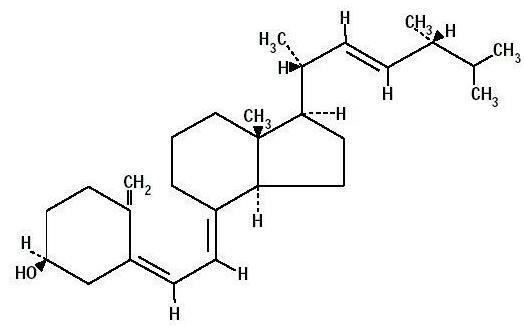 Of these, the intestinal bacteria produce biotin and vitamin K. Whereas, the liver produces the cholesterol. Therefore, we can include this latter group of nutrients in the class of conditionally essential nutrients as well. That means; under certain conditions, their synthesis may become insufficient. Essential nutrients, conditionally essential nutrients, nonessential nutrients, and non-nutrients are four categories of nutrients classified based on the essentiality. Both essential and nonessential nutrients have a potential effect on health. Also, we can obtain both types of nutrients from the diet. Essential nutrients refer to the nutrients required for normal body functioning but which the body cannot synthesize. Nonessential nutrients refer to the nutrients that the body can synthesize and can also be absorbed from food. 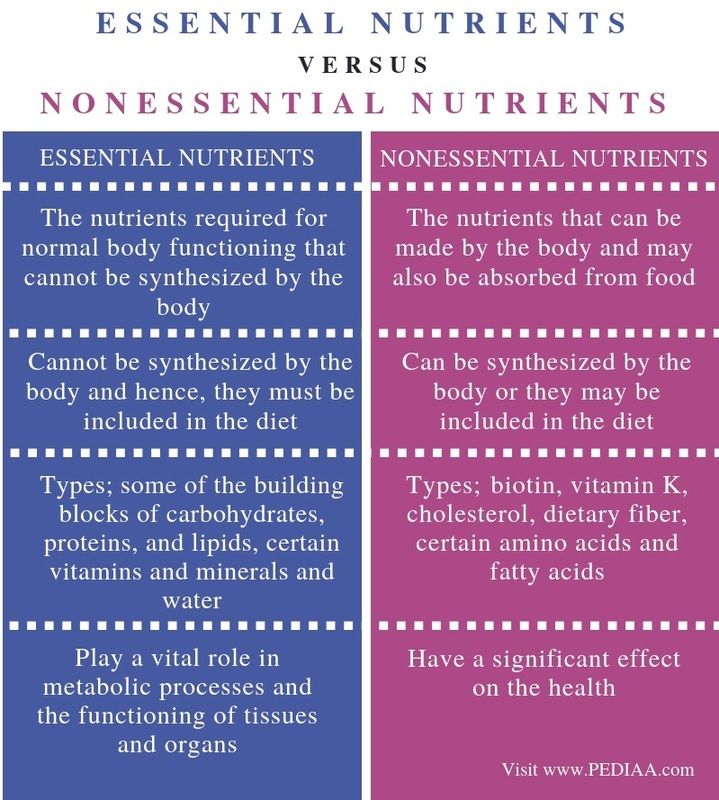 These definitions explain the fundamental difference between essential and nonessential nutrients. The main difference between essential and nonessential nutrients is the body’s ability to produce these nutrients. That is; the body cannot synthesize the essential nutrients; hence, we must include them in the diet while the body can synthesize the nonessential nutrients. Some building blocks of carbohydrates, proteins, and lipids, certain vitamins and minerals and water are essential nutrients while biotin, vitamin K, cholesterol, dietary fiber, certain amino acids, and fatty acids are non-essential nutrients. While essential nutrients play a vital role in metabolic processes and functioning of tissues and organs, nonessential nutrients have a significant effect on the health. Hence, this is also a major difference between essential and nonessential nutrients. Essential nutrients are the nutrients which the body cannot synthesize. Therefore, we have to include these nutrients in the diet. Building blocks of carbs, proteins, and lipids, vitamins, minerals, and water are essential nutrients. Whereas, the body can readily synthesize the nonessential nutrients by the metabolic process. Meantime, we can include them in the diet as well. Therefore, the main difference between essential and nonessential nutrients is the body’s ability to synthesize them.